Panchase trek is mini trek last for about the 14 days. First of all, you should arrive in Kathmandu. Then, you have to reach Pokhara via bus or plane. And, the next day from Pokhara you have to drive to Bhumdi 5500 ft through Thado Khola. Then after, we stay there for the over night. 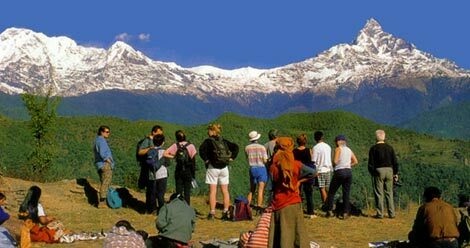 Also, from there you can explore the view of Ganesh Himal, Himal chuli, Manaslu, Annapurna range and Fishtail Mountain. Finally, the next day we move towards Panchase Bhanjyang 7100 feet. from there along the forest area. In addition, you can watch different species of birds in this area. Then, we stay there in lodge. And the next day we move on to Chitre 4810 feet in about 6-7 hours. Here, the trail ascends through the forest to the top of the Panchase Trek Ridge. 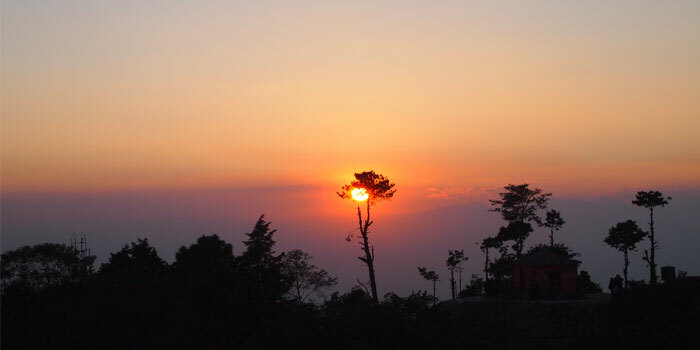 Therefore, you can enjoy the spectacular view of Pokhara, the Kusma Valley and the Annapurna. Then, the next day we travel along different villages to reach Birethanti 3,400 feet. Finally, the next day our trek ends reaching Ghandruk. Furthermore, it is a beautiful Gurung village. The roads here are totally made from the stones. In Ghandruk, the people living here are very friendly. The Gurung cultural and lifestyles can be studied in this region. We stay a leisure time here. The early morning view of Annapurna and Dhaulagiri is heart touching here in Ghandruk. The next day, our trial descends towards Pothana 5,600 ft. We climb down hill through Modi Khola, to cross the suspension bridge. Then ascend towards the Landrung Village, during the 4 – 5 hours trail. We could clearly view Annapurna and Machhapuchre Himal. Then, finally we will reach Pothana through Deurali. Here, at Pothana we stay an overnight in one of the lodge. The n, the next day from Pothana we’ll have a breakfast and move on to Dhumpus. Then, about an hour walking from here along the ridge we pass villages and paddy fields. And finally, reach Phedi. And, from Phedi we can take a bus to drive back to Pokhara. Then, after reaching there in Pokhara we have a day rest there. Finally, we visit Phewa Lake, Sarangkot , Mahendra Cave and Davis Fall in the Pokhara city. This brings the end of our trek. And we complete the glorious Panchase Trek at the ending by Himalayan Magic Treks. Day 01 Arrival in Kathmandu 1,310m Welcome by Gurla mandata trek Member and direct transfer to Hotel in Kathmandu with Bed & Breakfast plan. Day 03 Pokhara-Bhumdi 1,520m Start the day with a drive to Thado Khola, passing beautiful Davis Falls on the way. Trek to Bhumdi through lush forest teeming with interesting flora and fauna. The trail starts up a long staircase to a ridge before dropping down to Bhumdi. 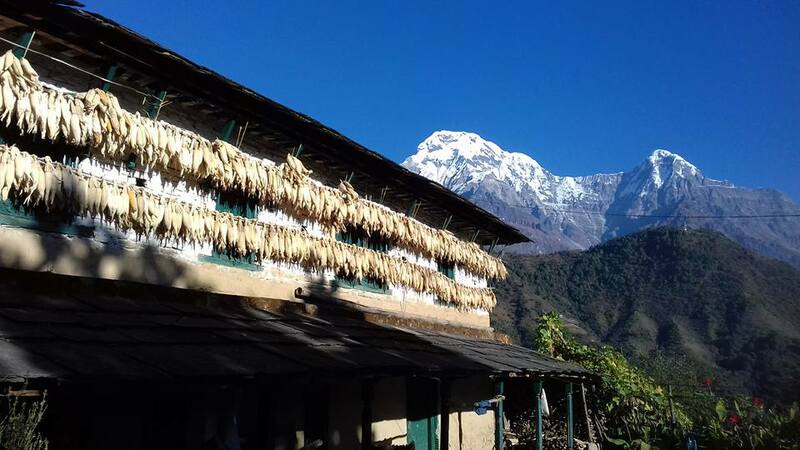 In Bhumdi you will have good views of Himalchuli, Manaslu, Ganesh Himal, Annapurna range and Fishtail. Overnight in Bhumdi. 3-4 hours walking. Day 04 Bhumdi-Panchase Bhanjyang 2,030m.If the weather is clear, you will have more opportunities to have great views of the beautiful mountains along the trail. Todays trek takes us up through forest and then onto Bhanjyang, a small settlement at the foot of Panchase. From here the views over Pokhara Valley and Phewa Lake are awesome. Overnight in Bhanjyang. 5 - 6 hours of walking. Accommodation on Guest House ( Lodge ) or provided Tents during the trek as mentioned in the trek type. It is a beautiful Gurung village. The roads here are totally made from the stones. In Ghandruk, the people here are totally friendly. The next day we travel along different villages to reach Birethanti 3,400 feet. The next day our trek ends reaching Ghandruk. The trail ascends through the forest to the top of the Panchase Ridge from which the spectacular view of Pokhara, the Kusma Valley and the Annapurna is seen. There are different species of birds found in this area. Here we stay there in lodge and the next day we move on to Chitre 4,810 feet in about 6-7 hours. The next day we move towards Panchase Bhanjyang 7100 feet. from there along the forest area. We stay therefor the over night. From here you can explore the view of Ganesh Himal, Himalchuli, Manaslu, Annapurna range and Fishtail Mountain. The next day from Pokhara through Thado Khola you drive to Bhumdi 5500 ft.
Panchase Trek is mini trek last for about the 14 days. After you arrive to Kathmandu you directly catch a bus of through flight you reach Pokhara,. Panchase hill 2,250m can be done for the spectacular views of Dhaulagiri, Annapurna I, II, III, IV, Lamjung Himal and Manaslu. Another possibility of Panchase trek is to trek from Panchase back to Pokhara via the ridge that runs through the villages of Bhumdi and Pumdi. The Panchase trek can either be continued to reach Karkinetta, to trek to Kusma, on the Baglung highway. The Magars, Chhetris, and Gurungs are the main inhabitants of this region. The an exotic panoramic Himalayan range. The trekking route passes through many villages and you may accompanied by the local culture and their hospitable welcome to their village. 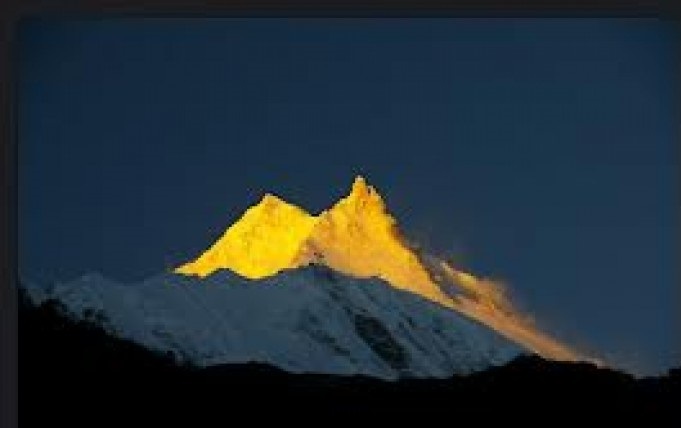 which gives spectaculars view of Holy Mt.Fishtail ( Machhapuchhere) Annapurna south, Himchuli, Lamjung Himal in the west of Pokhara. The Short Hiking destination of this trek is the local village of Panchase traditional. Panchase Trek is one of the best attraction of Annapurna mountains range from World Peace Pagoda and the easy & Classic trekking route in the western Nepal. The Gurung culture and lifestyles can be studied in this region. We stay a leisure time here. The early morning view of Annapurna and Dhaulagiri is heart touching here in Ghandruk. The next day, our trial descends towards Pothana 5,600ft. We climb down hill through Modi Khola, to cross the suspension bridge. Then ascend towards the Landrung ,Village during the 4 - 5 hours trail. We could clearly view Annapurna and Machhapuchre, Himal., Then through Deurali we finally will be reaching Pothana., Here at Pothana ,we stay an overnight in one of the lodge. The next day from Pothana we have a breakfast and move on to Dhumpus., About an hour walking from here, along the ridge we pass villages and paddy fields to finally reach Phedi. Then fro Phedi we can take a bus to drive back to Pokhara. After reaching there in Pokhara we have a day rest there. We visit Phewa Lake, Sarangkot , Mahendra Cave and Davis Fall in the Pokhara city. This brings the end of our trek.we complete the glorious Panchase Trek at the ending by Himalayan Magic Treks. We give our first priority to our guest to serve them at superior level that is what making us today Gurla Mandata Treks,. For the accommodation we have been providing star hotels in Katmandu and even normal guest house according to the guest demands and need. During the trek we provide standard Guest House with sound environment and hygienic food for the guest to make their trip happening and healthy. Since, Panchase trek is camping trek we provide comfortable dining, kitchen, crew, restroom tents and sleeping materials like mattress, Sleeping bags etc. We provide twin tent for our guest. We get paradise of food especially in the cities areas especially in Katmandu valley. We have a lot of restaurants with different cuisine in city but during the trek we get to eat from Continental and Nepali menu especially choices like Pasta, Pizza, Mo. Mo, soup items, Potatoes items, Dal Bhat, Hot drinks Tea & Coffee etc. We believe equipment's does matter to make your trip easy and comfortable. Caring excessive quantity of equipment doesn’t make your adventure more interesting but the drawback. So, we request you to carry only selected and needed one and save your extra expenses for other need in trek though we have our potential porters. Warm Clothes, Down Jacket, Trouser, T-shirt, Hiking Boot, Sunglasses, Sun cream, Knife, Walking Steak, day back pack, Head Light, Sleeping Bag etc. These are the equipment's which you most carry during the trek. Security is our primary concern! From your beginning day (we will be there to pick you up with our staffs and identity), to departure date (airport drop services) we are always there to help you. We have proper remedial services during the trek with professional staffs; first aid kit, oxygen bag and Helicopter service for emergency rescue whenever trekkers get physical Loss or altitude sickness. We have focused more on acclimatization days to get rid of altitude sickness too. Summer (June - August) and Winter (December - February). ,Though Summer collects heavy monsoon rainfall it is very much clear to trek around Mustang, Dolpo and Nar-, Phu valley since they are rain shadow areas. 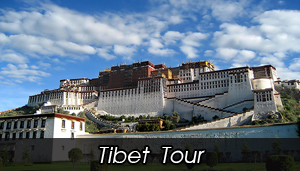 Tibet is much more favorable for Tibet trek. 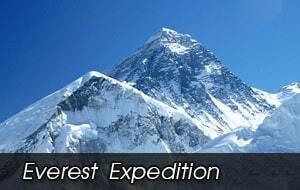 Everest, Langtang and Annapurna are always comfortable to trek even in winter season. Trekking in Nepal for Panchase Trek does not require past experience, though we have challenging route in Everest compared to Annapurna our itinerary suggests to walk comfortable distances. Trekking in Himalayas always takes us to challenging altitudes and rocky routes, demands proper rest time and acclimatization to sustain their strength. We always have both listed properly in our itinerary. However certain training like Running, Skipping and other workout will definitely help you in roots. We only leave foot prints! Gurla Mandata Treks is very much concern agency on environment pollution and Global Warming. We are always serious and genuine towards our garbage during the trek especially in Camping type. We collect all the rubbish and deposit it to proper place to protect our environment. We also partake in every program conducted in KEEP Kathmandu Environmental Education Project. We also suggest all travelers to protect our environment and Stop Global Warming. Profit oriented is not only our priority! we have been helping some of ours very villagers from different corners of Nepal to sustain their social life and help them with education and required materials. We are always looking forward for interested candidates in this field to give helping hand to support and inspire them for their better beginning and good future. If you are interested please contact us: gurilamandatatrek@yahoo.com They really need us, Support us to be their Helping Hand. 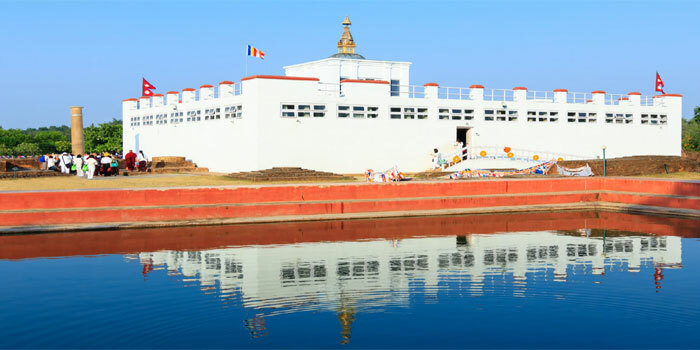 We have tailor-made program for Panchase Trek. Days in the itinerary are always flexible, can be increased & decreased depending on your holiday and time schedule. 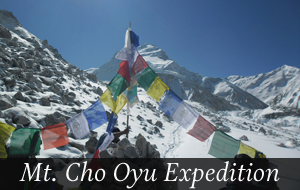 Trekking in Everest around the Himalayan region goes through unexpected complication like natural and health challenges resulting chances in the itinerary for your security during the trek by our professional guides and leader to take you to final point safe and sound so, please cooperate with your guide for you protection.